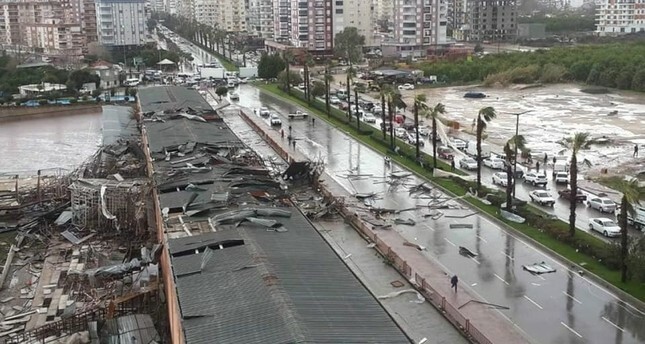 A tornado that struck Turkey's tourism capital Antalya on Thursday left two people dead, including a 13-year-old child, one person missing and at least 11 more people injured. The tornado caused damage to many vehicles, agricultural estates and greenhouses in Kumluca and Finike districts. The injured have been transferred to Kumluca State Hospital and their treatment continues. "Eleven were injured, including one critically. A university student went missing in Kuzderesi in the Kemer district," Antalya Govenor Münir Karaloğlu told Anadolu Agency. Karaloğlu said the female student was said to have been in the car with her mother when the storm dragged the car into a stream. "Her mother survived, but the 20-year-old is still missing," Karaloğlu said, adding that search and rescue efforts are working to find her. Bayram Demir, 40, a municipality employee, was critically injured and later lost his life in hospital. Demir, who was married and had one child, was reportedly struck by debris hurled around during the tornado.